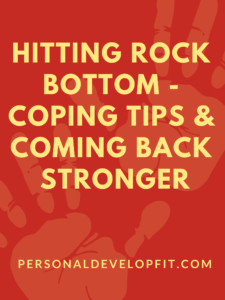 2.0.1 Dark Night of The Soul – Could Your Rock Bottom Be Spiritual Depression or Growth? Although you ultimately give your own definition to what hitting rock bottom is as you are the one going through it. Below is a quote, a dictionary definition as well as my own definition of this experience. Well stated by the likes of the ficticious character Tyler Durden played by Brad Pitt in the movie Fight Club. But I like to put the definition of hitting rock bottom as: Hitting a place where there is no light at the end of the tunnel, completely demoralized with no thoughts or feels or emotions related to finding a way out. That I truly can’t go any lower before death. The closest to death one can without actually dying. It is damn true that it isn’t something that happens in a weekends time. It can last and usually does last a lot longer than that. At a time when someone hits rock bottom, everything feels off. It no longer feels like everything happens for a reason. Why me? We may ask. What did I do to deserve this? Some rock bottoms are harder hit than others some may assume. But you can’t compare your rock bottom with anyone else’s. Because it is personal to you and you alone. Through catastrophic events though, are true self is revealed to us. Like it is looking back at us in the mirror, dishoveled, broken and bearing all emotion. What positive could ever come out of hitting such a low place? When one hits rock bottom, you can’t go any lower. It is a time to evaluate your life. You can keep doing the same things you’ve been doing and end up back where you started. Or you could say enough is enough. I have had it with myself. When one reaches this point in their existence. Transformation occurs. Often in all areas of their life. Spiritual, family, financial. If you can humble yourself enough to see that your old ways aren’t working then you will be more open to change and positive growth than almost anyone else on the planet. When people are stuck in their own ways, they never will change. Their feeling of “I know” aka pride is too strong. It has been broken down enough to have the motivation to change. When one hits rock bottom, is is the only REAL time where you can let go of pride completely. When you let go of pride your reach a level of courage and willingness that will perpetuate itself through your daily existence. When you hit rock bottom, you realize that you have to change. This again brings about a dissolve in ego. You are more compassionate and notice that it isn’t all about you. We are all in this together and you see and are able to relate to suffering in people. You can now offer solutions to those going through suffering and be able to build better relationships around it. Which when you help people through tough times, your actually gain insights into helping yourself more. That is what I have experienced at least. The world isn’t all about the little you anymore. Something bigger takes over, your true self. This self is the more real you. The more compassionate you, the more childlike you. When people haven’t hit rock bottom, they are so stuck in the hustle and bustle of trying to keep up with everyone else. They want to impress people they don’t like, but things they don’t really want or need, create attriubtes in their personality that doesn’t represent the true them. Once you gain the humility that comes with hitting rock bottom, the ego desires lessen themselves or disappear completely. From this point in life, you can now operate from your true sense of self. You will have more energy to go after the more meaningful things in life that are going to bring true happiness to your existence. Not doing things just to make it appear as if you are happy. Don’t get me wrong, you aren’t going to do away with the materialistic world, your goals will just be colored with a new energy now that is more predicated on your true soul desires. What you were put on this earth to do. After hitting bottom, you see that your old ways don’t work. Including blaming others and feeling like you are not the one in control. You gain a sense of full responsibility in your life. This makes you the true master of your own fate and the captain of your own soul as William Ernest Henley said. This will allow you to more so dictate your life and it’s happenings. You assume responsibility for every and everything changes. This means that if you are responsible for your hitting rock bottom financially, you and you only have the power to change that. If you have hit rock bottom. Now that the false you isn’t manifesting itself as strongly, you can now see through the fakeness in your life. You will have an inner knowing of who is building you up and who is breaking you down. You are now able to pluck out people and situations that aren’t beneficial to you. Which will transform your existence as you know it and push you towards a reaching your full potential. Hitting rock bottom makes you evaluate where you are drawing your happiness from and seeing that most of the things you doing aren’t bringing you true happiness. Being in such a dark place, you are looking for anything that will give you an escape from the darkness. Now you can do so in a way of pursuing passions that maybe you gave to pursue other things that you thought would bring you happiness or just did for the money. You can now rebuild yourself through creative expression and even making a living partaking in your truest soul passions if you choose to leave behind the world that made you hit rock bottom. There are many people out there seeks growth daily but can only move so fast because they don’t truly have the motivation for upheaval of habits that have sabotaged them. When you hit rock bottom, there is a uprooting of all that is not supportive of your benefit. Look at Bill W. the creator of Alcoholics Ananymous. It was said that he reached such a low point that he finally and truly surrendered with all of his being and going through the ultimate spiritual transformation. This rock bottom experience has helped tens of millions of people get past their rock bottom and will do so for many many decades to come. He also never took a drink again after being a raging alcoholic and referred by an article about him as being hopeless and seen as hopeless by everyone around him. This would have never happened if he didn’t hit rock bottom. And the same can happen for you. You now have the power to refrain from the action or actions that got you there. When you have no one to turn to or anywhere to go because you feel as if no one can help you. Often the only place to turn or the only one to look to is God. Even if you aren’t a religious person. Which most people who do hit rock bottom aren’t. You can still use God or whatever you want to call it, as a source to lean in on. If you are religious, this is an even better opportunity to use this time to grow closer to your God. 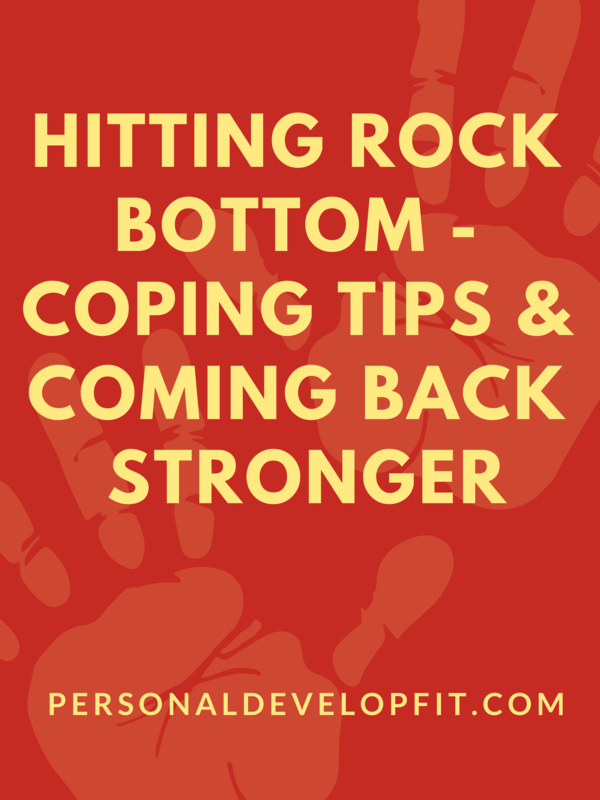 Not only can you become stronger from hitting rock bottom. Now you have material and life experienced needed to make money off of your experience. You can create a blog and help guided people through the experience. Write a book or ebook. Even pursue life coaching. You can earn from what you’ve learned. When it comes down to it we will look for an escape or a way a break from the negative feelings that can haunt us during these times. You learn that you can do so by doing peaceful things like going to the beach, meditating and letting go, painting, journaling your thoughts out nature walks. The simple things in life can aid heavily in getting you out of rock bottom. Now the comeback is the best part. It shows you who you really are and can build a bullet proof strength that call allow you to get through anything that life throws at you. Because at the end of the day, if and when you get through hitting rock bottom, you will have tougher than average skin. That again is why it is a beautiful opportunity that can be seen as a lucky thing to go through. Here is a list of tools and tactics you can use to break thorough and start seeing the light at the end of the tunnel. Your mind is incredibly powerful and can be one of the best things to use when trying to get out of your dark place. Every morning and every night, see yourself as living a great life after this experience. See it and feel it until it feels real to you. How is it going to feel, who will be there, who won’t be there. Feel deeply the feeling of empowerment you will feel that comes with beating your demons and living the rest of your life without them. Again, what you resists persists. There is only one true way to completely beat your rock bottom experience. That is through completely experiencing it. It can serve as a launchpad to create a fully transformed life if lived out completely. Or it can be denied partially or completely, leaving you indulging in the same habits that got you here, or even worse supressing it more with harmful and toxic methods. Doing this will set yourself for even deeper and more emotionally taxing experiences than you would if you faced the original experience of hitting rock bottom. At hopeless times in our life, we abandon our goals because we are too focused on getting out of dark times. Setting small goals and accomplishing them will allow you to feel a sense of achievement and give you momentum you need to give you a massive breakthrough. Start with small goals that aid in your recovery from the habits that have made you hit rock bottom and accomplish them daily. Also focus on bigger goals that align with the vision of what you want your new life to look like. This will give you purpose to push on when times are at their roughest. Also, you can create a vision board of what you want your new life to look like. Fill that damn thing up with the life that you want that is the complete opposite of what got you to the dark point. When we are in a dark place, dark thoughts run rampant. In order to counteract these thoughts you need to be listening to positive audio and reading positive material. The best time to do this is as soon as you wake up in the morning and when you are going to sleep at night. This will allow you to set a positive mood for the day and give your subconscious mind positive material to think about while you are sleeping. This may be one person or a group of people. Allow yourself to be vulnerable enough to reach out to people who really love you and have your back. There are most likely people who want nothing other than to help you if you let them in. If you don’t have anyone in your personal life, try and find a support group or online forums of people who have beaten dark times that are similar to yours. Keep a small journal with you all day and journal out your thoughts. This will be a great way of quieting the mind down from the thoughts that plaque you. An emotional release so to say that can bring you certain amounts of contentment and acceptance of your situation. When you volunteer your time to people that are really in need, you can see and relate to people who are in very dark times. This will put things into perspective that you are not the only one going through these times. This alone can bring a bit of peace as you no longer feel like you are completely alone. It will also get your mind off your situation and give you a positive escape. Dark Night of The Soul – Could Your Rock Bottom Be Spiritual Depression or Growth? If you have never heard of the Dark Night of the Soul, well the definition of it may feel relateable if you are reading this when hitting rock bottom. It has been refer to as a midlife crisis as many where all the walls seem to be falling away. You are left exposed to who you truly are, or at least the true you is trying to emerge! A beautifully written article around the subject talks about how it is actually part of your souls growing process and one of the 7 stops your soul will make on this journey here on earth. Ok, sound a little to deep or wacky? Stay with me. Essentially it is the olds ways of doing things just don’t make sense to you anymore. This could mean your job, spouse, friends. Everything just seems off and you feel it pretty much every hour of the day. Everything you have worked so hard to build suddenly seems like it’s collapsing underneath itself. Feel familiar? I only know about this because I feel that I have gone through the dark night of the soul and am somewhat still going through it. It is the attempt at essentially ego disolve, leaving the true you exposed. It has been so long if ever that you have really expressed the real you. That is why it feels so weird and there is so much resistance to this process. The best way to get yourself through this, as the teachings suggest, is to simply laugh at all of your demons. Face them with laughter. And change whatever you need to change to get you though this process, but do so slowly or at best when this chaotic storm has passed. Try not to be attached to the old you, which most likely you have identified with so long, that you think it is the real you. It is not. Don’t cling on. What you resist, persists. These two coexist extremely well with each other. Now I am not a psychiatrist so I am not saying your depression may not be a chemical imbalance. Which you should be evaluated by a professional for. But with my experience, I was extremely depressed when hitting rock bottom. Depression made me feel like I was not myself. Which is exactly what it can be an indicator for. That something or things are completely off and it should be an voice of reason if you listen to it. Look at it as it is trying to teach you something. What is depressing you the most? For me, I simply just couldn’t stand myself anymore. I was so deep in the hole that I had to make drastic changes in my life in order to get myself out of that depression. I couldn’t make gradual changes. I needed massive upheaval. Depression is an great teacher because it makes us feel vulnerable. We can no longer act like we have it all together any longer. We need to find a real solution to the big problems. Depression will most likely dissipate when you make the changes you need to in order to claw your way out of rock bottom. When hitting rock bottom financially it can be one of the most stress inducing times of your life. The best way I know to break out of is to change your mindset around money. You have reached this point of having no money for a reason. That reason is ourselves. We need to examine our thoughts around money and start doing everything we can to start shifting our thoughts, replacing negative non supporting money habits with positive habits that support financial abundance. Once you identify thought patterns that are sabotaging your financial life, you can actually change that thought by repeating a different positive thought enough times. Continue to repeat a thought over and over and it will set like a brick in hardening mortar. I learned this from the self help master Brian Tracy. So there you have it my friends. Things we can learn as well as the positive of hitting rock bottom. As well as how to get yourself out of it. Let me know what was most helpful to you! As well as if you have anything to add at all or just want to talk to me about your tough times! Shoot me a comment below and I will get right back to you! Talk soon. The Ultimate List of 35 Health and Fitness Myths and Misconceptions! Excellent writing, This is very encouraging especially when you are at the rock bottom. Thank you for your kind response Pat. I hear you my friend. Often times we see rock bottom as a place that we may never get out of. But some of the best things in life have came from people hitting rock bottom. I myself can testify for this. IF I can help in any way my friend, don’t hesitate to reach out! You are very welcome Matt.